I hit a brick wall last week. My whole body ached, I felt like a dead weight and could not muster the energy to get on the bike, in the pool or out running on the road. After nine weeks of hard training, I felt it was my body telling me it was time for a break. Rest up, relax. A bit of R&R would do me no harm. Or maybe it was my subconscious working away because it was Cheltenham week. The best four-days of horse racing of the year. I enjoy a bet on the horses now and again. Not big bucks, just a little flutter. 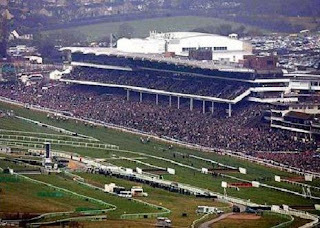 And when the Cheltenham Festival (top right) arrives, I get a little excited. So there was no better time to take a break. But, maybe I abused it. A Chinese takeaway on Monday, fish and chips on Tuesday. Oh and on Wednesday I headed to Cheltenham for a day of gambling and booze. Did I mention the cooked breakfast on the way down and curry (with starter) at night? To be honest, a day at the races was the best workout I could have had. And I lost a few pounds. The heart was pumping faster than it ever does in training as one of my charges was head-to-head going to the final fences. As usually happens with my bets, Carruthers decided to try and walk through a fence rather than jump it and the wind went out of its sails. But the nervous energy from the day was a great workout in itself. It was a refreshing change from the training and recharged, I got back into it on Friday before doing my own mini-triathlon on Saturday morning. Unlike Carruthers, I don’t want to be faltering at the final fence so no more breaks from training are on the horizon. But when that next brick wall hits me, will I be able to smash through it without a break for a flutter, curry and some booze? I wouldn’t bet on it. After all it worked this time. See Tuesday's Evening Post or visit www.thisisnottingham.co.uk for the story of arthritis sufferer Jacob Rickett's remarkable marathon challenge.